Dr. Cool Router Cooler | OhGizmo! In the same way I’m mostly certain the beverage ‘Dr. Pepper’ has never spent a single day in medical school, I have my doubts this ‘Dr. Cool’ contraption from Evercool even has a single diploma hanging on its wall. But since the website does claim it “has extensive knowledge in the cooling field” I’m inclined to trust it when it comes to cooling my… laptop? Nope. Tower? I’m afraid not. 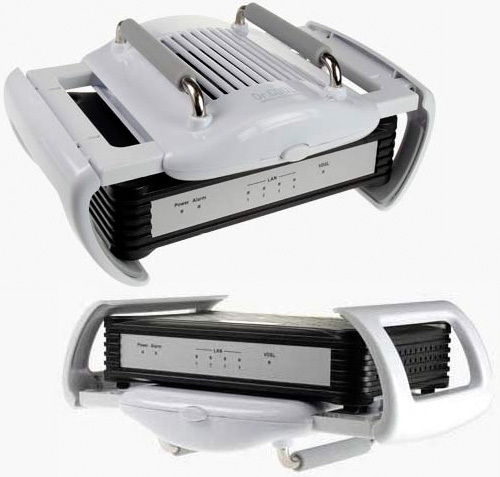 This device is actually designed to cool your router. As far as benefits go the only real tactile advantage they give for using it is prolonging its life, but then you don’t have an excuse to constantly upgrade to a model with the latest and greatest wireless standards. So no thank you! I wonder what this does for wireless signal strength. I cant imagine having a fan right on top the router can help things.